We humans are naturally enchanted by life at scales smaller than our own—from Gulliver in Lilliput to the Magic School Bus inside the human body. But our imaginations fail us when we get down to the truly tiny. A solid rock is built of atoms bonded into molecules arranged into lattices, all of which contain a surprising amount of empty space. What would it even mean to walk through that? 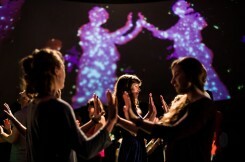 An innovative art installation called danceroom Spectroscopy (dS for short) can draw you into this sub-microscopic realm with the compelling immersion of a video game. In fact, dS uses Microsoft’s Kinect game controller to track your movements, then projects your body as an energy field into a computer-simulated atomic slurry. Atoms of hydrogen, helium, oxygen, carbon, and iron are rendered as streaks of colored light, attracted and repelled by each other’s energy fields as well as by the human-shaped interloper. It’s literally impossible for your movements not to be in time to the music, because the audio track—sort of ambient electronica—is generated by the action. The vibrations of the simulated atoms, their collisions and coalitions, are fed back into software that assigns them sounds. 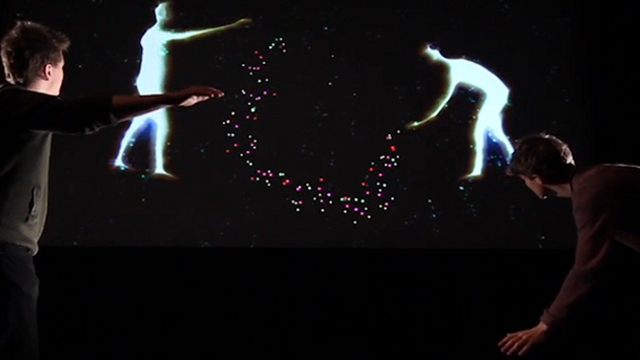 The result is a dance floor that is both visually and sonically responsive to your every move. danceroom Spectroscopy has made big waves in Europe; a huge 360-degree dome installation was part of the 2012 London Cultural Olympiad. The project is currently making its American debut at the Stanford Art Gallery until September 20th, open and free to the public. A professional performance which builds on dS, Dances of the Sacred and Profane, will be showing this weekend and next at Cowell Theater in San Francisco. David Glowacki, a scientist and artist jointly based at Stanford and the University of Bristol, started dS as an art project, an attempt to visualize something beyond our senses. Ordinary human vision can’t process the fundamental building blocks of matter, so we try to “see” them with metaphors: a solar system for an atom, TinkerToys for molecules. But these models are all static, what Glowacki calls a “time-stationary view.” Time is not stationary, and neither are atoms; in fact they are constantly shivering and shimmying around. Even inside a rock. And so dS was born in 2011. 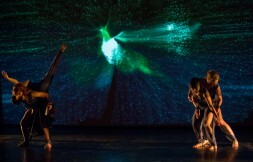 Glowacki has funded the project with both art and science grants, bringing together almost forty collaborators from the fields of physics, chemistry, computer science, contemporary dance, choreography and music composition. While the original aim of the project was purely aesthetic, the underlying structure has always been strictly scientific. Each atom’s movement is calculated precisely from its mass and charge and from the energy of the surrounding atoms—and human dancers. A system with so many interdependent equations usually takes time to solve, but dS needed speed. “We didn’t want the dancers or the public to get bored,” says Glowacki. Existing desktop computational systems simply weren’t fast enough to display the atoms responding in real time to human movement. So Glowacki and his colleagues pushed the boundaries of computer science until their artistic vision was possible—and now that it is, new research possibilities are opening up. Molecules can be named by their constituent atoms. H2O means that a single water molecule contains two hydrogen (H) atoms and one oxygen (O) atom. That’s a pretty small molecule, and its shape is consequently straightforward. But for big molecules, simply knowing their atomic recipe tells you little about their actual shape. Is C3H7NO2 looped into a necklace? Wadded into a ball? Doing the splits? Our bodies are full of big and bigger molecules, many of them carrying out hugely important tasks, like turning your food into energy or transmitting messages from your brain. Understanding the shapes they can be folded into is critical to understanding how they work—and fixing them when they don’t. So biochemists simulate these molecules, and set computers to the task of folding them. But computers are dumb. They don’t know which shapes are interesting and which are dead ends. What if a human could just grab the molecule and push it around, like an origami artist fiddling with a piece of paper? Chemists are beginning to experiment with a dS-based "Nano Glove Box" that allows them to stretch and fold model molecules to discover new configurations. Just a few months ago, Glowacki and colleagues published research showing that people can guide a simulated protein into shapes that a computer would be much slower to simulate. The polished audio-visual aesthetics of the system give it an intrinsic appeal, which raises the possibility of crowd-sourced protein folding. Generations that grow up moving in their game avatars like second skins certainly provide a natural pool of talent. “I’ve hooked up eight- and nine-year-olds and they play with it for hours,” says Glowacki.